A "front row" view of the San Francisco Bay! Imagine discovering a wine that sang to you with astonishing harmonies; a wine that was not just a beverage, it was an experience. That is wine by R&B Cellars. 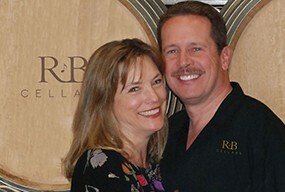 Artistically handcrafted by winemakers and musicians Kevin and Barbara Brown, R&B Cellars' wines are created with the same passion that the Browns bring to their music and with the same goal: to delight you with something extraordinary. Each wine has its own musical name and a beautiful, musical painting on the label by Artist Mimi Stuart. Our wines go beyond taste to provide a sensational experience in every glass. Where can you experience all this? Come to Riggers Loft Wine Company, R&B's winery, tasting room and wine bar in the historic Port of Richmond, right next to beautiful downtown Point Richmond. Soak up extraordinary views of the San Francisco Bay while sipping on lovingly made, award-winning wines. You can expect live music frequently, and may even be serenaded by the winemakers!